There are over 530 of us pastors, preachers, evangelists and catechists as servants of the Word in our fellowship of sister churches in Africa and India. Our union is of the CLCI, NCLC, BELC, ECLC, CLCK, EELCT, ELCC, CGLC,LCEA, CLCEA. We have several things in common, one of which is that we agree on the Word. Another common thing among us should be concern for each other even though we often are many miles apart. This concern for each other manifests itself in praying for each other. Most times we don’t know of needs in prayer, though that does not need to prevent us from remembering each other in a general prayer. Here are a few specifics to pray about as follows. In the BELC district chairman Moses’ father has suffered two heart attacks. He is released from the hospital. Pray for his recovery. Also Prabakar a pastor in the Nellore district suffered a heart attack and went to be with the Lord. Pray the Lord to give strength and comfort to his wife and three children. In the CLCEA Pastor Malyi’s father is 93 years old and suffering from diabetes and high blood pressure. Pastor is the one child who is helping his father at this time. Pray that the other children help also and that pastor is given an added measure of strength to aid his father. In the NCLC we recently lost Eyo as a pastor when he was drawn away to the Methodist church. Pray that he sees the errors there and returns. Nothing is impossible with God. These are only a few to pray for. Why not put in your prayer time one of the sister churches and its pastors each week. Or in some other way exercize this blessed Christian fellowship we have by praying for one another. We know that we of the over 530 need to be lifted up by each other in prayer to the throne of grace from which alone comes help. We are certainly thankful for the help of some of our ladies in the CLC USA. It was through Elinor Gbedey that we received the first contact in Lome. Through Charlotte Sotnyk we have received for VBS work in the BELC and the CLCI a number of molds for making plaster of paris plaques. The children can paint these and take them home. Now Randi Pomerantz is allowing us to use her production of the Invisible Sunday School. It is being translated into Telegu and Tamil for use in VBS. A complete set in English is going to Pastor Gideon in Ghana, while a complete set in French is going to Pastor Kossi in Togo. Any of our brothers who want to find out about this tool for teaching children are welcome to ask for samples. For Telegu and Tamil translation we have one page of a simple Bible story followed by a picture to color. There are 52 lessons. Any translations that are made will be put on the website www.lutheranmissions.org and be available for use. We are all in this great Kingdom work of His as brothers and sisters to serve Him and reach others. Take the task he gives you gladly, Let His work your pleasure be. l. Jacob’s family – Joseph – Egypt. Gen. 45:1-15. 2. Joseph in Egypt. Acts 7:8-10. 4. Paul and the others aboard ship. Acts 27:33-44. 5. Lot – Abraham. Gen. 14:12-16. 6. Gideon and his army. Judg. 7:7. 7. Israel – Pharaoh at Red Sea. Ex. 14:10-31. 8. The Child Jesus. Matt. 2:11-16. 9. The disciples of Jesus. Mark 4:35-41 and Luke 8:22-25. 10.Jesus of His cross by Simon. Mark 15:20,21. 11.Christ has delivered us from the penalty of sin. Rom. 4:25; 8:32; I Cor. 15:3; Col. 1:13. 14.Shadrach, Meshach, and Abednego. Dan. 3:19-29.
l. A husband and his wife who died suddenly and strangely within three hours. 2. Paul spent a good deal of time in the home of this devout husband and wife. 3. This husband and wife refused to let their neighbors name their child. 4. This husband was warned by an angel to flee with his wife and her Son to Egypt. 5. This husband and wife made themselves aprons of fig leaves. 6. An ancient Jewish husband and wife whose names God changed. 7. This husband saw his wife change into a pillar of salt. 8. This husband and wife had favorite sons. 9. This husband and wife were blessed by the Lord for having loaned His their child. 10.This husband and wife first met on a farm near Bethlehem. 11.This husband and wife were much concerned about Jesus on the day of His trial. 12.This husband and wife took a long boat ride. 13.This husband and wife had Jesus as their wedding guest. 14.This husband and wife hid their child on the River Nild. 15.This husband and wife did not want their son to marry a pagan wife. 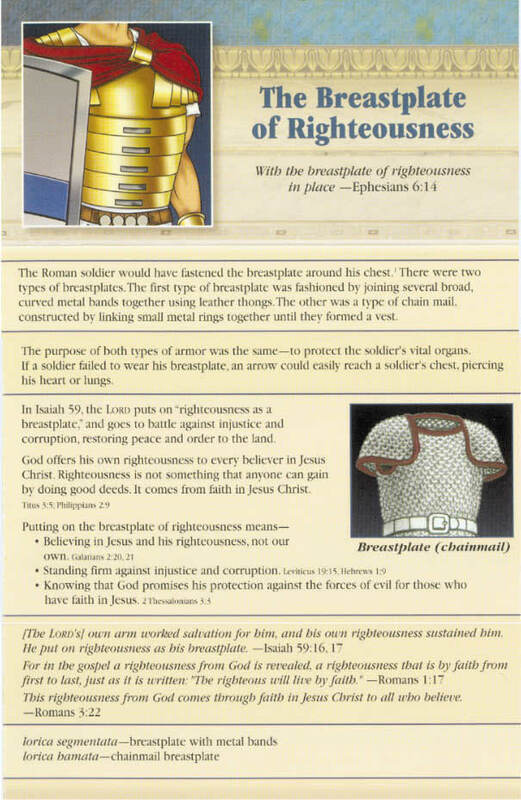 We begin a series on the Armour of God, CLICK HERE to see attachment.